CVs were ready, cover letters were filed and students were dressed to impress. Dubai Science Park was buzzing with job seekers today, as it opened its doors to fresh graduates with an engineering or biomedical background. 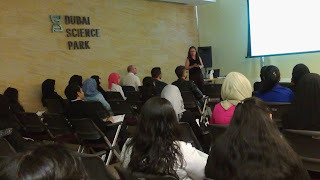 The School of Life Sciences attended a career fair at the Dubai Science Park, today, to familiarize themselves with the job scenario within the region. The career fair hosted reputable companies such as PSNL, Himalaya, Amerispecs, Pfizer, among others, all under one roof. Students were required to carry multiple copies of their CVs along with them and were asked to drop their CVs at the stalls of the companies that appealed to them. 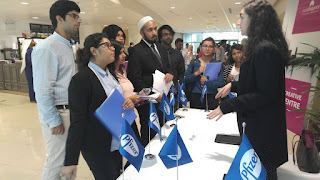 From CV writing techniques to insightful networking sessions, the career fair covered all career related needs in a nutshell. Most students know what they want from a company when they apply for a certain job role, but it is equally important to understand what companies expect from prospective candidates. A science background was a prerequisite for some companies and an option for others. "We are looking for students who are passionate about doing something creative where they can explore the wider horizon of their own theoretical studies and apply the same. Our offer is not restricted only to those who hold a science background. We expect a mix of diverse talent, as it is with every company. Initially, the students would test waters with an internship and if we like them and if they like us, we would take it to the next stage with a secure job," discussed Sheikh Zaman, Country Manager, Eurofragrance, Dubai. "The career fair gave us a wide opportunity to experiment in the field of biotechnology. What really appealed to me were the opportunities in the perfumery industry, offered by Eurofragrance, Dubai," said final year Life Sciences student, Khadija Ahmed. "How do I structure my CV, how long should it be, what achievements go into a CV and what stays out?" You may have often racked your brains trying to find answers to these questions. The students found their answers to these questions in a valuable session on CV writing techniques and were given tips to ace a job interview. Fruitful and productive, the career fair catered to both; students keen on life sciences and engineering. "This was a great exposure for us, since we learnt about the real world of business and job hunt and even how to communicate with people," commented final year Life Sciences student, Duena Mazarello. The writer is a final year Media and Communication student, specializing in Journalism.